If you have a Central Pneumatic air compressor, and you didn’t buy it used, from a garage sale, or from on on-line end-of-line wholesaler, odds are pretty good that you bought it at Harbor Freight. In 2017, Harbor Freight offers about 35 different Central Pneumatic air compressors, from a 1/6 HP air brush style to a 5 HP, almost commercial type, on a 60 gallon air tank. They even have one model of a gas-powered, wheelbarrow style, that is quite well priced. Central Pneumatic air compressors can be purchased through Harbor Freight on-line, or at the many Harbor Freight stores found throughout the United States. Buyers of Central Pneumatic air compressors are, pretty much I think, aware that you get what you pay for. This line of compressors is entry level. I don’t believe they are made for serious compressed air use, where whether or not a compressor works means that trades persons do or don’t do work that day. Which is not to say, if you are a periodic user of compressed air – the typical small workshop or home garage for example – you won’t be happy with this brand of compressors reliability. I just wouldn’t put the supply of my plants air system at the mercy of this particular brand. While Harbor Freight boasts of having manufacturing around the world, I would be surprised if they actually owned a factory that makes air compressors. Their entire line is similar or identical to compressors of other brands with different colors and different labels. I could be wrong and will be happy to indicate so if someone can provide proof that HF actually makes their own compressors. Regardless of whether they make them or not, try to find parts for a Central Pneumatic air compressor. Aside from pressure switches, gauges, regulators, PRV’s and check valves (all the same as those found on many other brands) there are very few repair parts for the compressor pump or the motor. Parts from other Central Pneumatic air compressors can often be used on other models of this brand. If you can scrounge or buy a non-working compressor, some parts from the old can be reused to fix others that have failed. Depends on your skill level as to whether or not this works for you. If you are having a problem with your Central Pneumatic air compressor why not add a question or comment here? Include the model number of your compressor. As a result, perhaps the Central Pneumatic air compressor owner/user family, which is a huge one, can offer advice as some of them will, undoubtedly, already dealt with the same problem you are experiencing with your HF Central Pneumatic air compressor. Can you tell me where to purchase? I believe that the electric motor brushes are specific, but not necessarily compressor brand specific as the motor manufacturers make compressor motors for so many different brands, though many have the same motor. If you Google “replacement compressor motor brushes” see if you can find them in this manner, since you’ll not likely get them at Harbor Freight. Model number? Always had it plugged into the same outlet? In the two weeks, did you run it a lot? Is there anything else drawing power from the same power plug as you have the compressor plugged into? Thank you willyr. I’ll give it a try. I’m new to compressors and wanted to purchase a lower end model to see exactly what I need before spending more money. Ironically, in the past I’ve got a lot of mileage from Harbor Freight tools with a little care and on occasion some modification. Thanks again! shuts off after a few seconds.Have to drain air completly before i hit reset button.Finally wont do anything.Motor ran good though. Are you using a power bar or extension cord to power the compressor? If not, what is the amperage of the circuit into which you are plugging the power cord? So I’m guessing start cap then. Daryl, if you haven’t done so already, Google “reed valve kits” then “Central Pneumatic reed valve kits” and then “Harbor Freight compressor reed valve kits”. I found a bunch. You might get lucky and find yours. I found a kit that looks identical in design. Not certain about bore size and bolt spacing. . . do you know if Central Pneumatic ever utilized the same compressor pump as Campbell Hausfield? This is the reed valve kit in question: https://www.fix.com/parts/compressor/campbell-hausfeld/fix10243074/valve-plate-kit-hl026100av/?Source=GAWS%3fSource%3dGAWS&gclid=Cj0KCQjw4qvlBRDiARIsAHme6ouwrYROpYNgH0Thhyfea5GD2AmSb9gOvAaSp5usD5ZJESCQniO4EbwaAtl4EALw_wcB Meanwhile, I’m going to attempt to translate the grid scale to see if the bore and bolt spacing are the same. Daryl, sorry for misreading your original post. I’ll get this up so that perhaps someone can tell us if Campbell Hausfeld made your compressor. I guess you changed the location of use of the compressor? Are you using a power bar or extension cord? Have a look at this page too: https://fix-my-compressor.com/compressor-wont-re-start-when-air-is-used/ and let us know if the unloader valve is working as it should, okay? You are welcome, and apologies for mixing up the replies. Has the compressor been tipped over? Has there been a recent oil change? Is the compressor taking longer than normal to come up to the pressure switch stopping pressure? I have oilless airbrush compressor. It stops and jumps around now. Not much air coming out of the regular. After jumping around, it then stops for a few seconds and then starts jumping again. What is the problem? Linnie, while you know exactly what you mean, I’m afraid I don’t. What does “jumps around now” mean please? Are you saying the compressor starts and stops too often? I take it this compressor has no tank, is that so? When this is occurring, are you using the compressor for long periods of time at one sitting, and are you using any extension cords or power bars to get power to it? Jason, please tell us what model of Central Pneumatic / Harbor Freight air compressor we are talking about, and which gauge… the tank or the regulator? Tank empty of air? Power at the plug? Power from plug to compressor? Power after the pressure switch, indicating that, with the tank empty, the switch is now “on” and passing power to the motor? Need a bit more info to try and further diagnose the issue, Joy. Where can I get parts for 3gal. Oilless need a piston and sleeve, It’s about 5 years old. 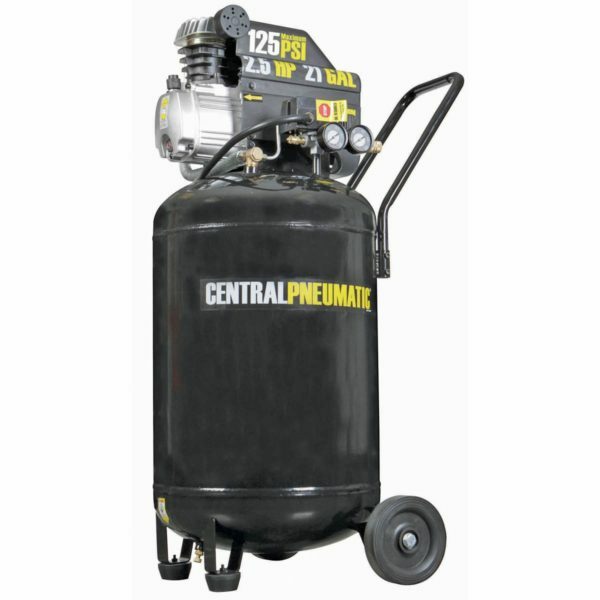 I have a central pneumatic 125 psi 21 gallon model number 61454. It will come on build up to 40 psi and shut off, hit reset button and comes on for a few seconds before going back off. Just replaced pressure switch, any suggestions as to what the problem could be, can bypass reset button and it continues to run. Yeah, same answer as before I’m afraid. Harbor Freight are still selling these. Is yours fairly new? If so, talk to them too. been looking for days now for 3/8 24 to 1/4 npt adapter/reducer so I can put an accessory in line with this regulator I have. any one know where? I’m curious of the intake air flow on the 1.8 oil-less compressor motor. And hokE, I’m curious as to how come that information is of interest to you? I’m trying to conceive of a reason, and cannot think of one. Perhaps, before I spend a lot of my time researching the issue – since I, and I suspect no one – knows the answer right off, care to let us know the how come? I’m going to hook up an oxygen concentrator to it. Basically making a very small on demand system for a torch. Okay, let’s see what we can dig up, and for sure, I hope that another visitor with some information on this can chime in. Hey Ryan. If you don’t mind visiting one more page on this site, this one talks about getting a new air intake filter. Let us know if this helps, will you? The manual states that the power supply be 120VAC / 60Hz / 14A (Dedicated circuit recommended). I surmise that the inrush requirements of the compressor, coupled with it’s distance from the power panel, contribute to the motor pulling more amps than the circuit can handle, and the breaker trips. Try plugging the compressor into a socket as close to the panel as possible, with nothing else pulling power, and see if it starts OK.
How do I remove the black plastic cover on the HF 6 Gallon 1.5hp oil-less compressor model # 62380. Am fighting a leak problem but need tp get at the guts to continue my troubleshooting. Their are five M6 x 30 screws located in the recessed holes in the top of the cover. You’ll need an extended metric bit to reach them. See the holes but no heads on screws. Seems like they are coming up from below. David, the manual, which you can get directly from the CP / Harbor Freight website, shows that, for your model, the screws are in the top. Maybe contact them if the manual is wrong? A few pages linked from here: //fix-my-compressor.com/air-compressor-problems-and-fixes/ address this issue. Good to empty the tank as a first step. No success there, trace the power flow from before the pressure switch to the motor circuit. All good? Then see if there is a capacitor on this compressor motor. If so, check that. See how on the page on this site. Could be unloader, could be start capacitor, if no change in where you use it or the power supply. These are, in my opinion, “light duty” air compressors, and are suitable for hobby shop or home workshop intermittent use. Cheap to buy, expensive to maintain. If you need compressed air on an ongoing basis, moving up a quality notch might not be a bad idea. I have a central pneumatic air compressor model #94667 which has quit pumping higher than 45 psi, so it never cuts off. I have to shut it off to keep it from running constantly and burning up. What may be my problem and can I repair it myself? When you’ve done the checks, add a comment if you need a bit more help. Mine did exactly the same thing. I took it apart and the piston ring was broke. I’ve looked all over and can’t find a replacement. If you haven’t measured the broken ring, and simply Googled “piston ring with xxxx dimensions”, you should. Someone is making the rings and you should be able to find a non-OEM version. No idea where the clicking is coming from, Chris? I wonder if it may be the centrifugal switch, if this motor has one and the clicking may be a warning of the switch gunked up, weakened to the point of failing, or burnt? I have a harbor freight air compressor that I purchased used.. it’s a stand up 21 gallon rather 150psi. The tank only builds about 80psi and the the prv pops and starts letting the air out?? I thought maybe the pressure gauge was reading wrong, but tried using my air gun to remove a lug and it does not have enough psi to do it.